43rd and Chestnut is one of those delirious blocks pounding with construction. It’s hectic. It’s loud. It’s nearly impossible to traverse on foot, and the redevelopment of this little cut of West Philly is just getting started. Stacks of boxy new townhomes are beginning to line the streets, while old mainstays like Lee’s Auto garage at 4200-04 Ludlow Street are being razed in a frenzy. In the center of the commotion is Christ Memorial Reformed Episcopal Church, a craggy Gothic Revival mountain chain built in 1887 that anchors the block with an ancient presence. 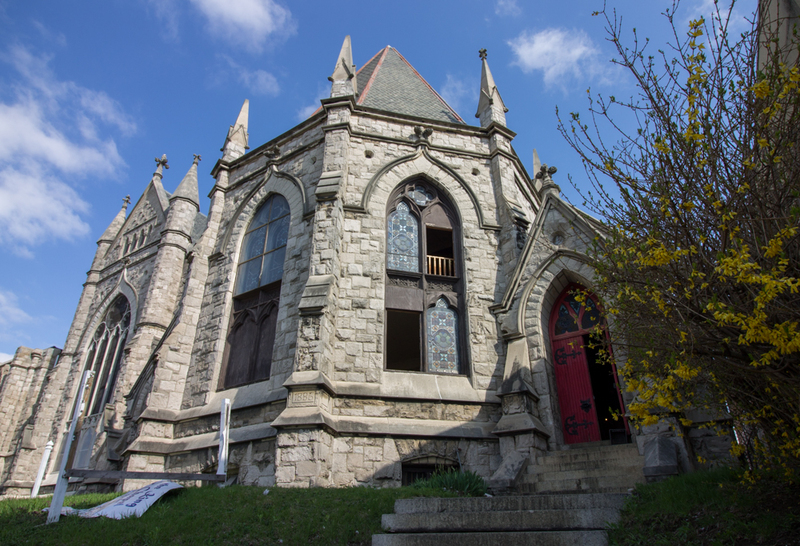 After 14 years of half vacancy and accelerated decay, the stunning, crumbling church will soon be demolished to make way for a vacant lot. In August 2004, the 171-foot stone steeple of Christ Memorial collapsed during a violent thunderstorm. Lightening struck the West Philly church sending the spire, described once by a historian as “a great exclamation point on Chestnut Street,” crashing down through the corner entrance to the sanctuary causing an estimated $8 million in damages. The small congregation and Jane Addams Place, a women’s homeless shelter, continued to occupy the building despite a lack of funds to cover and repair the damaged roof. After a two-year legal battle with GuideOne Insurance, the church was sold to local developer Guy Laren for $712,150. In 2014, the roof underwent extensive repairs, including partial demolition and structural stabilization. In the years since, operations at the women’s shelter have continued and limited prayer services have been held in the chapel, but the rest of the church remains vacant and decaying. 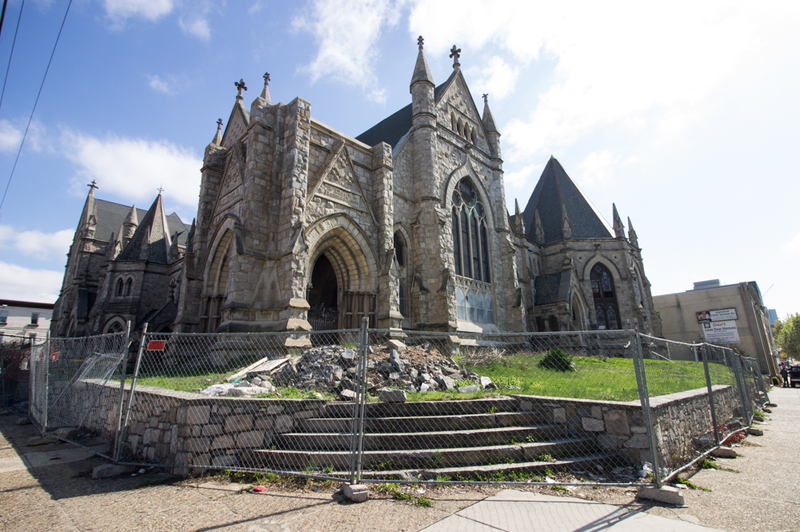 A demolition permit approved on April 11 states that the entirety of the church will be demolished in May. A vacant lot is currently planned for the parcel, but that may not last long. The area is zoned CMX-4, which allows for dense commercial and residential development. According to the Preservation Alliance for Greater Philadelphia, the owner purchased the property with the intent to rehabilitate and reuse it, but ultimately decided that the effort was way too big. Laren, who has a reputation for being a preservation-sensitive developer, swooped in at the 11th hour to save the Church of Atonement at 47th & Kingsessing. 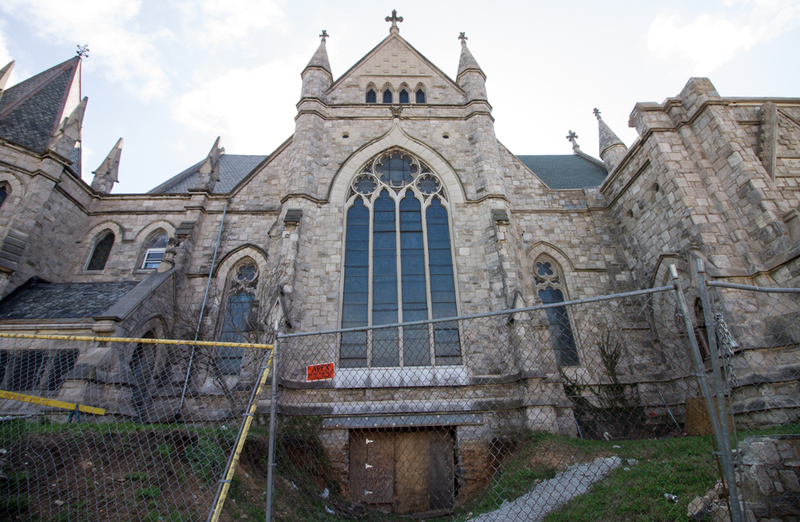 The Frank Furness-designed church, which was slated for demolition in 2015, is currently being converted into apartments. Despite multiple requests, Laren could not be reached for comment. The Alliance began drafting a nomination for Christ Memorial for the building’s placement on the local register, but the nomination was never submitted. Since the demolition permit was applied for in November 2017, any immediate efforts to place the building on the register would have no legal say. In the meantime, young mothers pushing strollers can still be seen entering the heavy wooden door of Jane Addams Place. 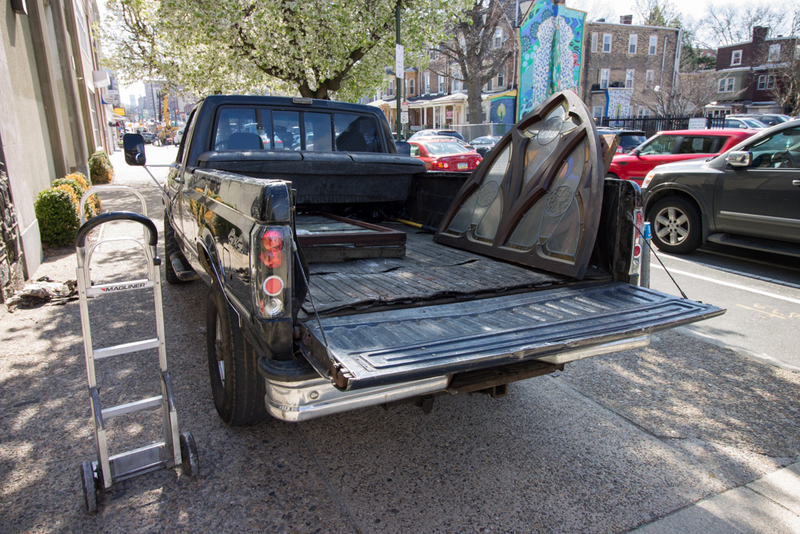 But a salvage crew removing stained glass windows signal the end of times for yet another historic landmark in Philadelphia. Spring School of the Arts used to be in that building. This would be a horrific architectural loss for the city, if not the greatest in recent memory. a real loss. we’ve los+ way +oo much in archi+ec+ural his+ory. This church is magnificent! It should remain in ALL its glory. Beg, borrow, steal or crowdfund. We, the residents of Philadelphia need to find an excellent repurpose for this architectural wonder. I’ll start the brainstorm with condos/mixed use. Stewardship, public or private, demands a higher calling —– unfortunately, it is sorely lacking here and serves as a reflection of the present time. It’s sad. People move into the city for its unique atmosphere, part of which is its historic buildings. Once again Philadelphia rushes to become as bland as suburbia .